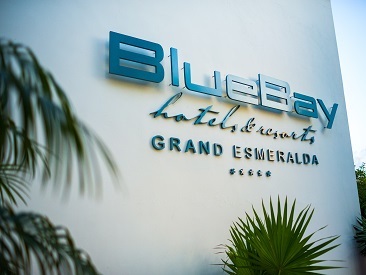 The Blue Bay Grand Esmeralda hotel in Playa del Carmen is a full service all-inclusve Riviera Maya hotel offering all the facilities necessary to unwind and relax in style and comfort. A spacious world-class modern spa, a fully equipped gymnasium and an idyllic beachfront location guarantee a memorable vacation experience for all ages. Children of all ages are well catered to with their own ‘Playstation’ room and mini-clubs with all kinds of fun activities. The hotel’s restaurants are renowned for their excellent and varied international food. BlueBay Grand Esmeralda hotel offers a variety of water sports as well. 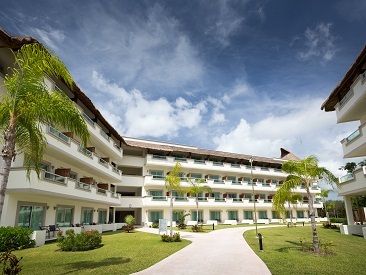 Blue Bay Grand Esmeralda offers 979 Deluxe Rooms and Suites, spacious and handsomely decorated with an elegant hint of an old Mayan village with colorful tropical details, spread out in eight 2 and 3 story buildings (all handicap accessible equipped with elevators and wheelchair ramps). 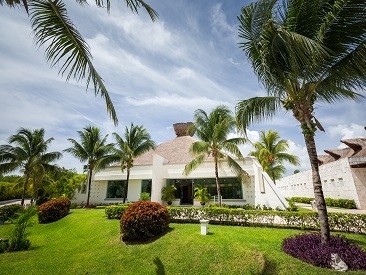 Each building has its own concierge offering customized service to guests. The luxurious Suites have direct access to either a swimming pool or a Jacuzzi. · Nanny Service (subject to payment, 24 hours). Booking in advance and subject to availability. · Laundry (subject to payment) · Free Wi-Fi is available for one device per room. Additional devices can be added for a nominal charge per day.